It’s an ambush! You’re surrounded and there’s nowhere to run, the only option is to fight, so make your last stand count. 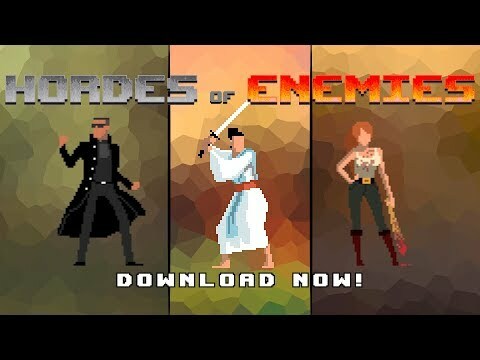 Do you have what it takes?Its fun to mindlessly destroy bad guys, try it!Hordes of Enemies is an endless single player horde/wave survival high score game, designed for short bursts of entertainment. With simple tap or swipe based controls anyone can easily pick up and play without going through complex tutorials.Hordes of Enemies features 3 movie inspired beat ’em up scenes to play, each with different enemies.• The Last Samurai: A samurai and his katana in hack n slash against the army of ninjas.• Zombie Apocalypse: A girl and her bloody baseball bat against the waves of undead.• The Chosen One: The hero must face countless amounts of agents in a brawl fight.Game features:▸ Optional Blood Effects▸ Game Services – compete on the leaderboards & achievements▸ Cloud Save – sync across all your devices▸ Haptic Feedback – optional for added immersion on supported devices▸ MFi game controller support▸ Fully localized into 12 languages▸ Gorgeous retro pixel art by Gustavo Viselner▸ Original music by Stuart DuffieldIn-app purchases are completely optional and you can play the whole game without purchasing anything. We wanted to create a simple and fun game that we would want to play ourselves and we hope that you’ll feel the same, enjoy!If you like our game please take a moment to rate & review it on the Play Store. We are planning to add more scenes in the future and your input would help immensely.